Stevia, Stevia rebaudiana, is a food flavouring. The leaves are used in South America to sweeten their Mate drinks. Leaves are 300 times sweeter than sugar but with no calories. Fresh or dried the leaves are used to flavour and sweeten drinks, baked foods, preserves and diet food. A treatment for hypoglycaemia and a digestive aid. 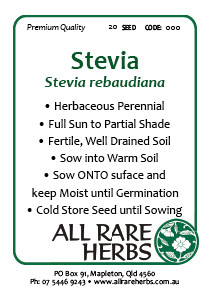 Stevia is native to mountainous areas of Southern Brazil and Paraguay. Prefers rich, moist well drained soil in a protected sunny position. Clusters of tiny white flowers in summer. Frost and drought tender. Perennial deciduous plant; may die-back to ground level. Grows to 1m x 0.6m. Be the first to review “Stevia, seed” Click here to cancel reply.